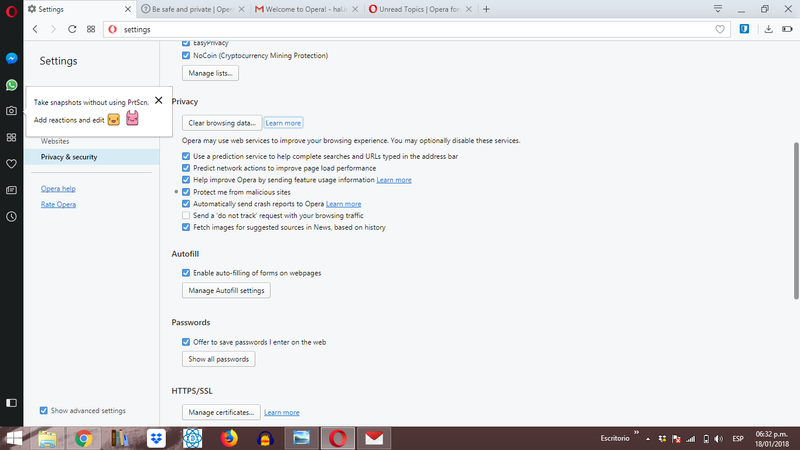 I'm trying activate the the inbuild VPN option for Opera Windows but as you can see on the image, the button is just not where is supposed to be, right after the Privaci section. I don't know if there's a restriction for my country (Chile) or is something else, i would appreciate any help on my problem. I'm running on Win 7, i think is a chinese version, i don't! know if that is important. @halincandenza You forgot the image. @halincandenza VPN is not available on China but I don't know how Opera detects if you are in China. @halincandenza when ya say you're trying to activate you're checking here in setting to make sure vpn button can be visually seen..
@leocg I´m not in china, it's just my windows version. @halincandenza Most probably it's making Opera think that you are in China. halincandenza last edited by @leocg This post is deleted! I am in China and I have the same problem. China does not allow Opera's VPN, so you will not be able to enable it there.